If you’re like most Disney Fans you have souvenirs in your home that reflect your passion. There isn’t one room in my home that doesn’t have something Disney related. I have a plethora of books; numerous posters; over 100 (yes over 100, you read that right) shirts; an entire china closet filled with plates and other fragile items; countless photos displayed on my walls; a fridge covered in magnets; bumper stickers; car decals and much more, all with one thing in common – they are Disney related. I do have some very favorite items in my collection, and that is what I am going to share in this blog. 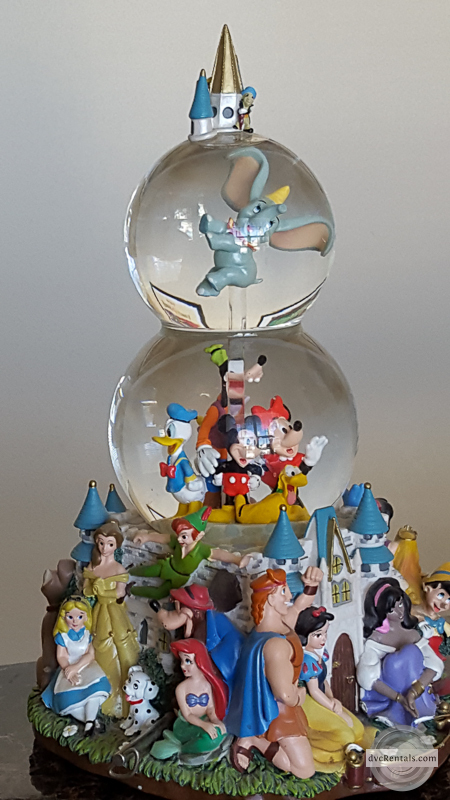 First is this gorgeous triple snow globe that is just over one foot tall. 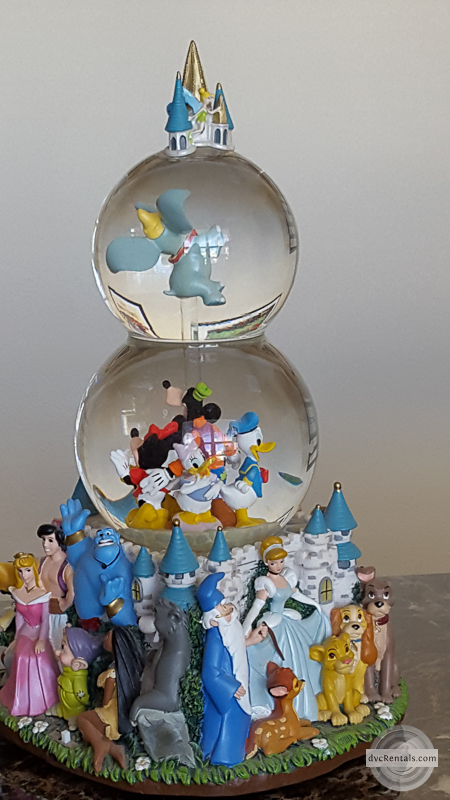 All four sides are adorned with characters from well-known Disney films, starting with Snow White and continuing to feature all animated films released in the early 2000’s (when I originally bought the globe). Each side is chock full of characters. It’s hard to have a favorite so I rotate it now to vary “who” is in the front. The top of the globe has Jiminy Cricket on one side and Tinkerbell on the other if you turn it 180 degrees. When you wind it up the globe with Dumbo rotates and the song A Dream is a Wish Your Heart Makes plays. I still have the original price tag on the bottom, which reads $120. Due to is size I imagine it would be much pricier now. Next, here is a beautiful Hanukkah Menorah with Disney characters. 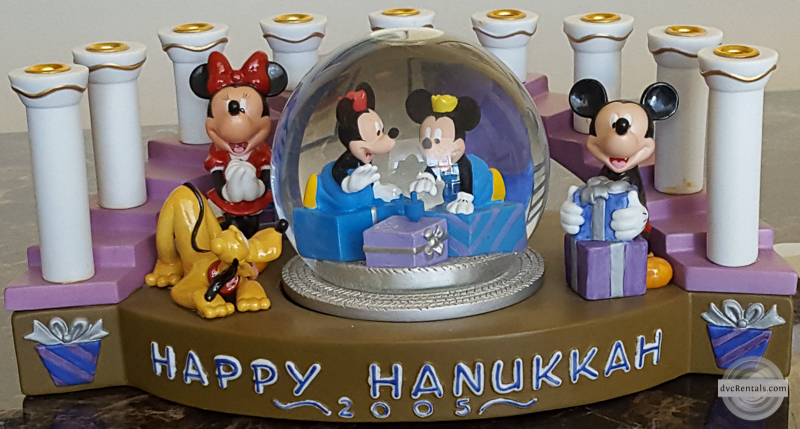 Although in recent years I have seen a few more items, back in 2005 when I purchased this there was very little Disney related Hanukkah merchandise. I have never used this as a “real” menorah because I don’t want it to get any candlewax on it, but I do take it out of the china closet and keep it next to the electric menorah I use during Hanukkah. The snow globe portion can be removed from the base to shake it up and make it “snow”. I did a little research and it seems these menorahs were made from 2000-2005. I love the colors and it’s nice to have something Disney out during Hanukkah. The next item is a cast exclusive that I just got this year. 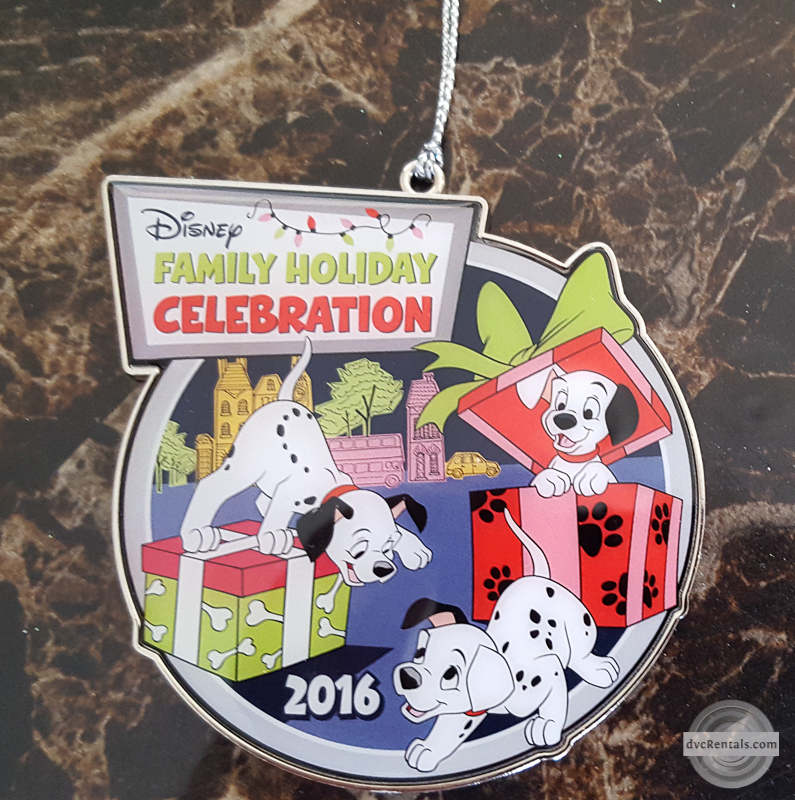 Each year Cast Members at Walt Disney World, along with some other perks, get a free beautifully designed ornament. This year’s was a celebration of the premiere of the original 101 Dalmatians 50 years ago, and it’s as cute as could be. But my favorite part is the inscription on the back. As a Cast Member I interact with a lot of guests. I try my best to go above and beyond to make each guest feel special. Sometimes managers notice things Cast Members do and make a point of saying something about it. But since it’s our job to make guests feel special, there is not a lot of back-patting going on for the most part, and it’s not expected. My satisfaction comes from making a guest happy, it truly does, that’s why I work at the Happiest Place on Earth, creating Magic! But still, it’s nice to be recognized, and even though the inscription was for all Cast Members it really warmed my heart. 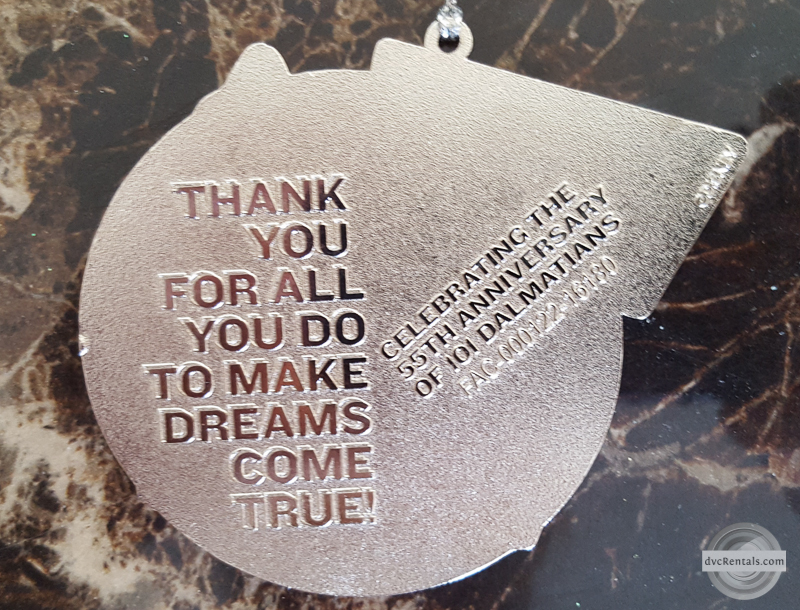 “Thank You For All You Do To Make Dreams Come True”. Dorky though this may sound, I cherish the ornament and what it stands for. As it’s my favorite classic Disney animated movie, I have a HUGE Lady and the Tramp collection, going back over 30 years. 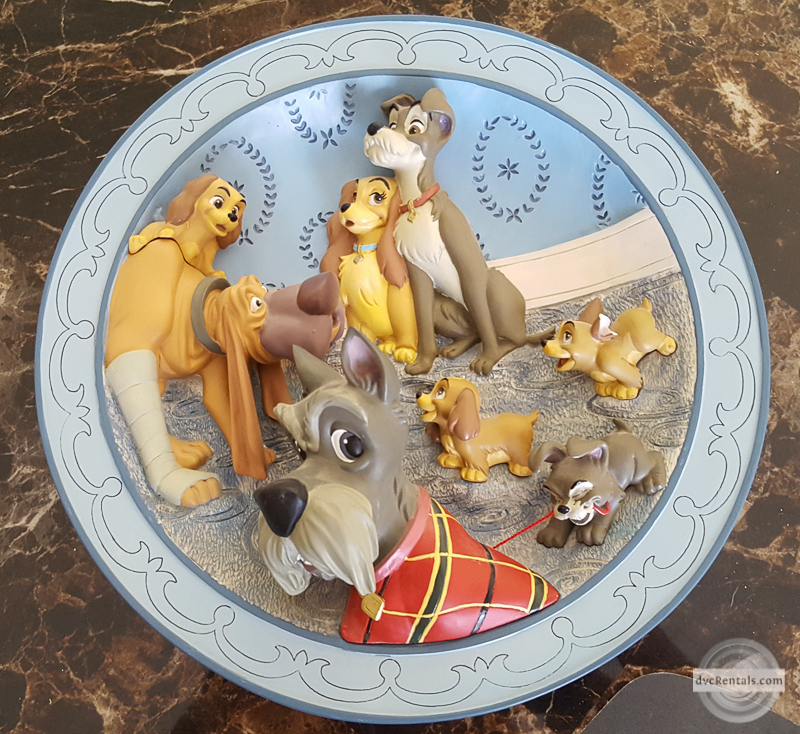 I’ve got everything from pins to plush to mugs to pillows, to posters to figurines to – well, you get the picture, I have a lot of Lady and the Tramp stuff! I have a few ceramic plates from the film, but this one is my favorite. If you know the movie, at the very end Lady and Tramp have puppies, and Jock and Trusty, best friends with Tramp and Lady, come to visit the babies. The plate depicts this scene. It is three dimensional, with all the characters jutting out from the plate. Little Scamp has a small piece of real cloth thread in his mouth that he’s “pulling” out of Jock’s sweater. Mom and Dad look on proudly. I particularly like the 3D aspect, and the scene is so very adorable. My next favorite is a plate I’ve had for many years. I still see it up for auction occasionally for about $20, so this is a pretty good deal if you find it appealing. I guess depending on our age we all remember Walt at different stages of his life. Some of us have only seen him after he had already passed. I started watching Walt Disney’s Wonderful World of Color when I was quite small, along with seeing Walt occasionally make an appearance on the Mickey Mouse Club. 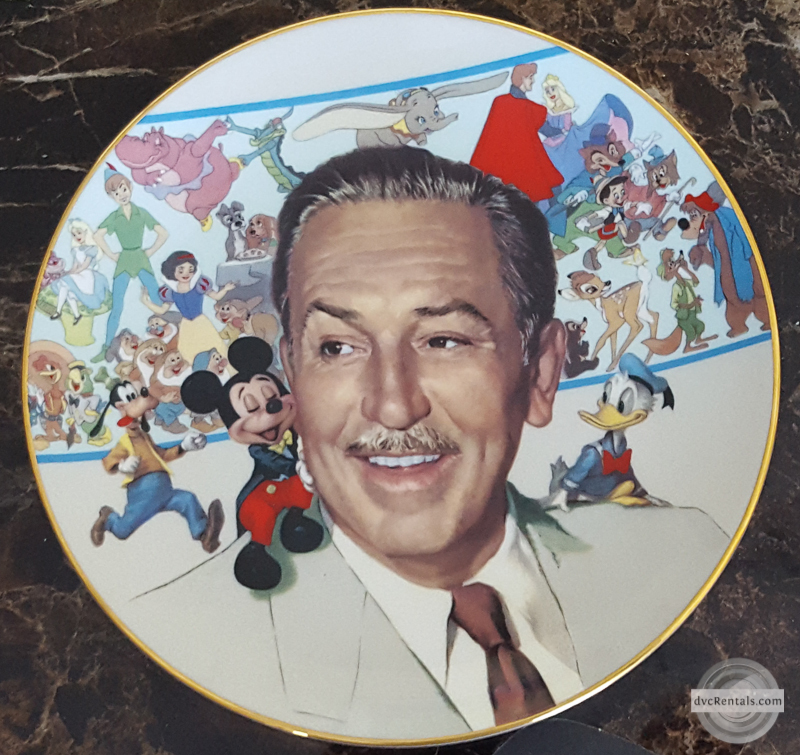 The Walt I remember from my childhood looks very much like the man on this plate. He’s surrounded by characters from the 30’s to the 50’s, the ones I grew up seeing either in the movies or on TV. The plate is rimmed with gold trim (although if it’s selling for $20 I doubt it’s real gold LOL). It makes me feel good to see this plate, it brings back wonderful memories of being a child. Another favorite is a pin I got because I won a random drawing at work. 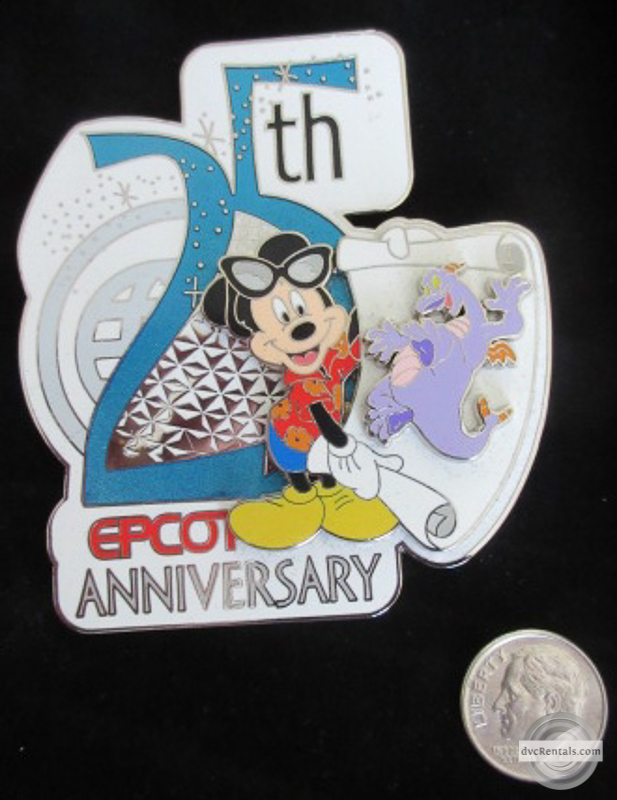 It’s a super large pin commemorating the 25th Anniversary at Epcot. My mother was a Figment fan and when her first two grandchildren were small (the oldest is now 40!) she bought them Figment plushes when she went to Walt Disney World in 1983. There turned out to be a total of 5 grandkids, and they all eventually got their own Figment. So anything with Figment touches my heart (sadly, Mom is gone now), and this nice big pin with the dancing Figment makes me smile. I also like the Spaceship Earth background and the way they worked the “25” into the pin. Lastly, if you were at the Magic Kingdom November 18, 2003 you would have seen a number of large (people sized) statues that had just been unveiled in front of the train station before you entered the park. These were part of a series called “InspEARations”, a celebration of Mickey Mouse’s 75th birthday. Mickey (and Minnie) both are considered to have been “born” November 18, 1928, the day the first Mickey Mouse short cartoon, Steamboat Willie, was released. In honor of this occasion celebrities were given a “blank” white statue of Mickey and asked to decorate it themselves. For example, Ellen DeGeneres did one that had a shout out to Dory, the character she played in Finding Nemo (at that time there was no Finding Dory). The statues were on display for a while at the Magic Kingdom before moving around to various venues for a yearlong tour of the USA in 2004. In 2005 they were moved to Disneyland, where they remained until 2015. They were then auctioned off, with most profits going to charities. My favorite one is called I Speak for Mickey and Mickey Speaks for me. It was done by Wayne Allwine who did the voice for Mickey Mouse for 32 years. I discovered there were miniature versions of these statues, so I bought one. 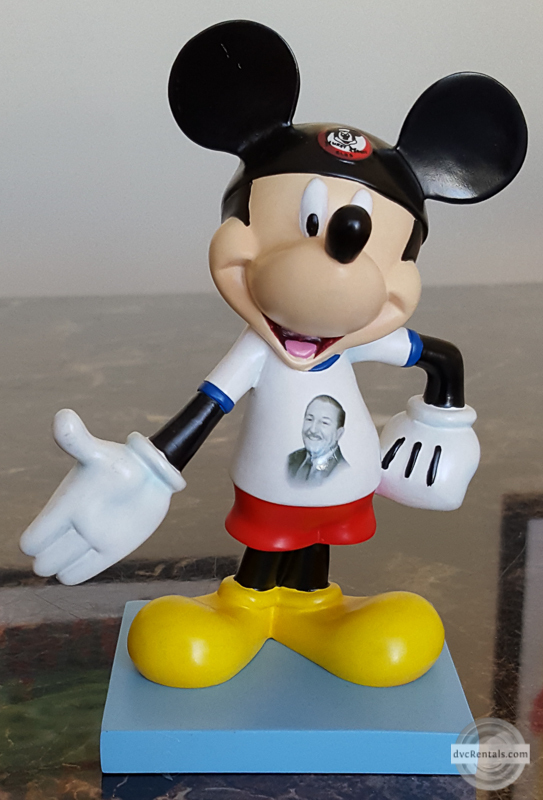 I love the shirt with the picture of Walt on it, the statue has a classic feel to me. I hope you enjoyed reading and seeing some of my favorite Disney memorabilia. No doubt most of you have some of your own. It’s nice to take some of the Magic home with you, and there is no scarcity of things to buy! If you are not already aware, Disney has an app called Shop Disney Parks, it’s available both on iPhone and Android. If you want to see what’s new at the parks download the free app. You can even order from the park and have it sent to your house! But it’s fun even if you just browse and dream. 7 thoughts on "Favorite Disney Memorabilia"
It is in the attic but my lunch box in first grade was a Mickey Mouse one-1964 and it has a Mickey seal by the latch-made out of metal. I am and I scoop stuff every time I see it! David’s Disney Vacation Club Rentals DVC Rentals that would b correct!! !